21 May Our Honey Bees Have Arrived! Our bees arrived this week. Two colonies of them from Georgia. Jill took a bee-keeping class recently and scored a huge load of bee-keeping equipment at an auction, so we were ready to go. 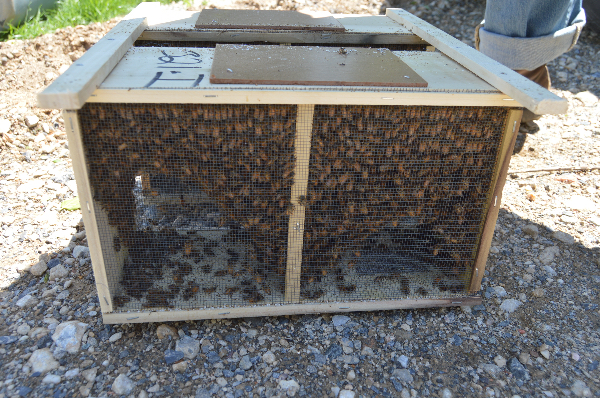 The bees arrived in two small, screened boxes. You have to wait for a sunny day to install them. The queen must be separated from the other bees until they get used to her– she’s in a small screen enclosure. After a couple of days, you open up her little cage and then she joins the rest, who then swarm around her. The queen has one job, to lay eggs. The drones have one job, to impregnate the queen. 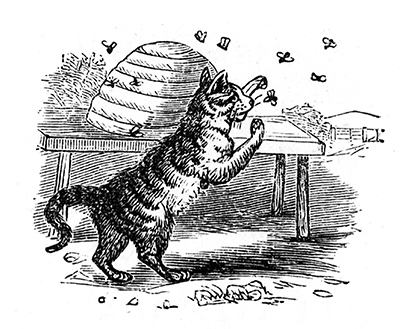 The workers do the rest–collect the pollen, build the comb, make the honey. All workers are females. Most of the drones are expelled from the hive when winter approaches. 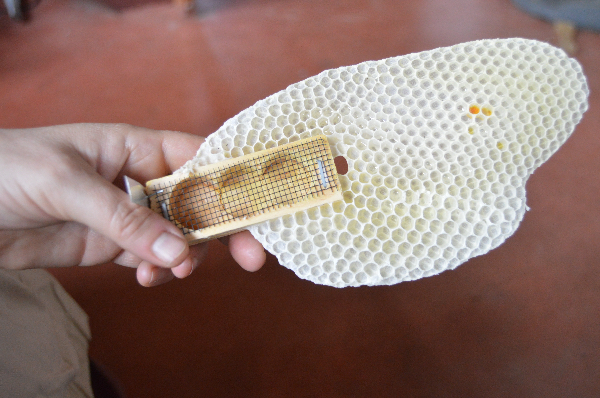 The workers started making the comb even before the queen bee was released from her cage. We have to feed the bees initially, leaving two jars of sugar water inside their hive. Once they settle in, they (the workers) will venture out to gather pollen. And so it begins. Eventually the colony will grow so large that it will leave the hive and swarm out in search of a larger home. That’s why it’s a good idea to have an empty hive or two nearby. Also, you can expand the current hive by adding more boxes. Honey bees are from warm climates — Asia, Africa, the Mediterranean. So, they need some help getting through the winter. You have to leave them their honey so they can feed themselves in the cold months, for example. A really harsh winter can kill them. Worse, honey bees are dying in great numbers because of pesticides. Specifically, a class of pesticides called neonics–Neonicotinoid Insecticides—is killing them–stuff used on common crops, like soy beans, and even in your backyard. 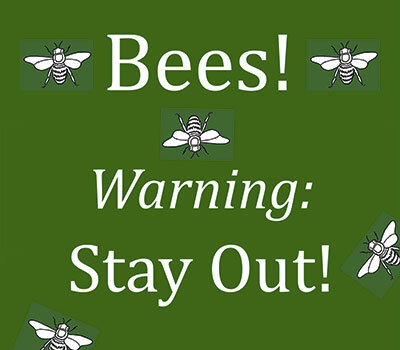 At the very least, these insecticides weaken the bees’ immune systems, making them vulnerable to diseases. 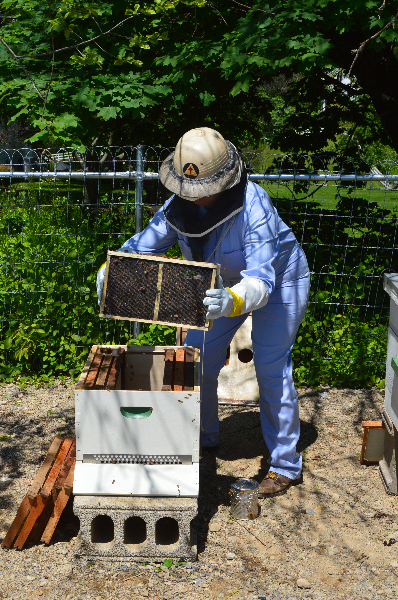 Last year, Maryland lost 60% of its bee colonies. Understandably, Jill and I are worried about ours. So we’ll be watching them closely and hoping for the best. We’re putting in lots of their favorite flowering plants. If all goes well, after one year, we can start harvesting honey and celebrate these remarkably industrious little animals.